Murdock: "Flight 2-0-9er to Denver radio, climbing to cruise at 42,000. Will report again over Lincoln. Over and out." Joey: "Wait a minute! I know you! 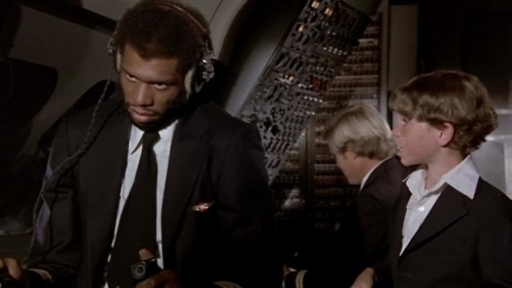 You're Kareem Abdul-Jabbar! You play basketball for the Los Angeles Lakers!" Murdock: "I'm sorry, son, but you must have me confused with someone else. My name is Roger Murdock. I'm the co-pilot." Joey: "You are Kareem! I've seen you play. My dad's got season tickets." Murdock: "I think you should go back to your seat now, Joey. Right, Clarence?" Captain Oever: "Nah. He's not bothering anyone. Let him stay here." Murdock: "Fine. But just remember, my name is ROGER MURDOCK. I'm an airline pilot." Joey: "I think you're the greatest, but my dad says you don't work hard enough on defense. And that lots of times you don't even run down court. And that you don't really try...except in the playoffs." Murdock: "The hell I don't!" (Grabs Joey by collar.) "Listen, kid, I've been hearing that crap ever since I was at UCLA. I'm out there busting my buns every night. Tell your old man to try dragging Walton and Lanier up and down the court for 48 minutes." I have no Iowa teams to root for so I have decided to hitch my wagon to San Diego State's star. They are my de-facto team for 2011. My bracket lives & dies by them. Wow, I was just saying that I've got SDS going all the way. By the way, I love that scene, and that movie. In many strange ways I feel that the "goofy" movies of that era taught me comedy. Ya gotta love the Aztecs. No tradition, no history, getting ready to mix it up with the big boys. They're a high seeded Cinderella. Which is why I fully expect them to lose to Northern Colorado in a few hours.